"Where to enroll and apply Aadhaar in Andhra Pradesh"
After successfully filliping the all Aadhaar required details, then you can contact any authorized enrollment center in your circle along with the "POA and POI documents". poi and poa documents means your Identity proof and your Address proof and all valid mandatory documents for Aadhaar enrollment process. 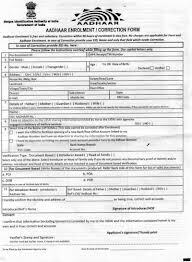 So download the Aadhaar enrollment form and complete the Aadhaar registration process and avail the all benefit provided by Government of India and your state level benefits.